Built into a wooded mountainside, the entire miniature golf course at Lahey Family Fun Park has most of the original trees that will provide you with natural shade and a relaxing environment. Come to Lahey Family Fun Park for this spooktacular haunted miniature golf event which is open every weekend beginning September 29th through October 29th. Average hole length of 40 ft. There are 5 beautiful waterfalls with 7 fast-flowing streams that wind through the entire course, keeping the game interesting. 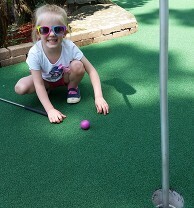 Miniature golf is a great activity to enjoy with a group or friends or a company event!